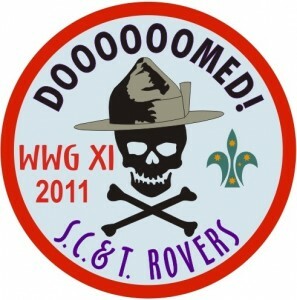 The 11th South Coast and Tablelands Weekend Wide Game saw the Scouting movement doomed due to the Branch Commissioner disappearing for unknown reasons, possibly due to the number of errors made on the A1 forms, or due to unrelated matters. This game involved scouts voting for a new Branch Commissioner and working through a series of tasks to gain influence on their votes. Venturers, however, hated the idea of an authority figure, and ran wild trying to stop the elections. WWG XI had Cataract Scout Park turned into a scaled down version of the scouting movement, during a political election, which required buried regalia to be discovered in the last minute of game play. With a total of 52 Patrols (5 more than last year), the eleventh Weekend Wide Game has hit the record yet again. As well as Leaders, Rovers, and Venturers, Cubs also joined in who visited briefly and were also involved in gameplay. This was the third event that WWG have used barcode scanners and mobile computers to record the scoring and assist in the final calculations of scoring. This year was the first year for trialling live data, transferred over Cataract’s Wireless Network installed for Australian Jamborees. Each patrol were provided with 20 votes to begin the elections, and worked through various activities to gain influence on their votes. Patrols also joined forces with their elected commissioner and fellow patrols to work as a team to ensure their commissioner and promises were made. There were several bases, including the ‘Corridor of Doom’, ‘Hall of the Committee’, ‘The Mad Hermit’, ‘The Lost Venturer Unit’ and ‘Village of Doom’, each requiring scouts to complete tasks to gain influence and game items. It was decided upon by the WWG Admin Committee that only ‘Place Holders’ will be stated in WWG Game reports. These place holders are below. The game had attending statistics of 6 Cubs, 265 Scouts, 34 Venturers, 6 Rovers, 59 Leaders, 1 Adult Helper and 10 Admins. Patrol’s raw scores and positions are unavailable for this game as a new scoring tactic was required (based on the 4 ideals) for this game. The Rovers of the South Coast and Tablelands wish to extend a heartfelt “Thank You” to the Venturers and Leaders who contributed their time and effort in helping WWG XI be a great success.